We appealed to the President to do everything in his power to stop the bloodshed. PRAVMIR. June 20, 2014. 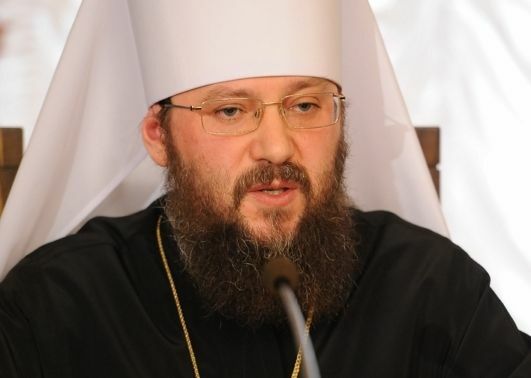 Metropolitan Anthony of Borispol and Brovary, Chancellor of the Ukrainian Orthodox Church, called the Synod of the Ukrainian Orthodox Church session that met on June 19, 2014, an “anti-war” synod. “You could say that it was an anti-war synod. The accepted appeals are permeated with the call to cease fraternal bloodshed in the country’s East. We heard reports of bishops who carry out their obedience in the diocesan areas that have become flashpoints: in the Donetsk and Lugansk regions. “The reports related numerous instances of death and evidence of the dire socio-economic situation of many districts, which are on the brink of a humanitarian catastrophe. It was necessary not only to respond to these reports, but also to warn all our Church’s people who worry about the tragedy in the East. “We appealed to the President to do everything in his power to stop the bloodshed. This is important. Everything else can and should be negotiated and discussed, but all problems can be solved peacefully. Now the main thing is for people not to die. This is the position of the Orthodox Church in Ukraine. This position, I think, is clear to any Christian”.